Thirty MassBay students, Professor Susanne Steiger-Escobar (Chair of the Computer Science Department and Professor of Computer Science at MassBay) and Professor Afsaneh Ghanavati (Adjunct Professer in the Engineering Department at MassBay) visited Artaic Innovative Mosaic in Boston, MA, on Drydock Avenue. Artaic was founded by Dr. Ted Acworth, a scientist and engineer who also serves on the Governor’s STEM Advisory Council and is a Steering Committee member of the Massachusetts Governor’s Advanced Manufacturing Initiative. (Travel was funded by the DOL Grant). Photos are from the visit to Artaic. Framingham High School students came to a Manufacturing workshop at MassBay with Professor Marina Bograd, Department Chair of Engineering and Assistant Professor of Electronics Technology & Engineering Design at MassBay and Professor Janine Lloyd, Department Chair of Mathematics and Assistant Professor of Mathematics at MassBay. The MassBay students simulated the entire manufacturing process from concept development to design to final product for the high school participants. Students from Quantitative Reasoning discussed packaging redesign and engineering students assisted students using SolidWorks 3D design and modeling software to design a bottle and then 'print' the design on the 3D printer. A luncheon discussion led by Carol Staffier, Dean of the Center for Corporate Training and Community Education (CCTCE) at Massbay with MassBay students, faculty and staff and industry partners Bill Holt of Web Industries in Holliston, MA and Charles Dougherty of the Charles River Center to discuss the skills students need for the manufacturing industry, the types of equipment in industry and how MassBay Programs align with the needs of industry. 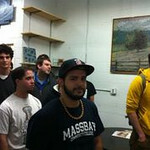 MassBay students listening to the explanation of phase 1, the mosaic design process.